In our last posts i share a post about how to wire a single phase motor. Single phase motor wiring connection learning is very important for electrical technology student and for every one. As i said that i already share a post about the one phase motor wiring but in my last diagram i wired the motor with one pole circuit breaker but in this post we will learn that how to wire single phase motors with two pole circuit breaker. This wiring diagram and wiring connection is better then form first one because we control both wire or supply connection (neutral and phase) and we can switch both wire any time by using the 2 pole or 2 point circuit breaker. As we know that single phase motor is a capacitor start motor which can not be start with out a capacitor and its required a capacitor to start. You can also learn the function of capacitor by reading below post. 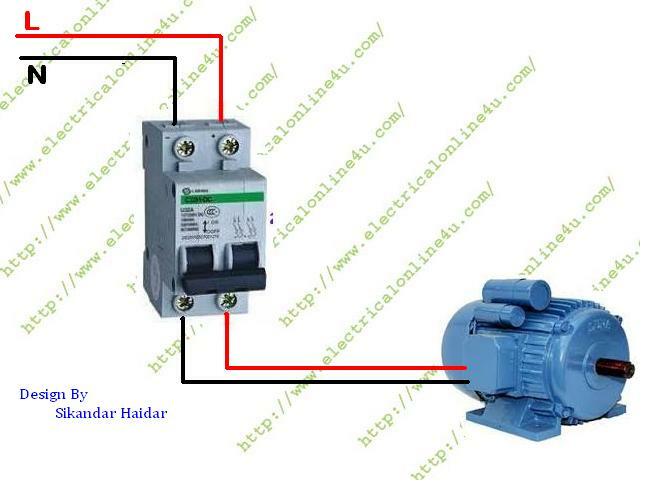 To wire the capacitor start motor with two pole circuit breaker connect the AC incoming supply wires to the input terminals of circuit breaker and then connect the induction motor wiring connection or motor supply wires to output terminals or point of breaker as shown in below single phase motor wiring diagram. 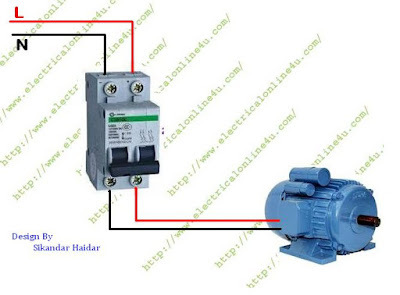 This is very safe and protected connection and we can disconnect or switch off the complete electric supply from motor. This is one of the big reason of this connection that we can work any time with out any problem. I hope you learn from this single phase motor wiring diagram and now you will be able to wire you induction motor him self. Thank you for visiting……..